Viewing alternate haplotypes (Multi-Region View). Obtaining exon coordinates and sequences. Exon-only display mode (Multi-Region View). 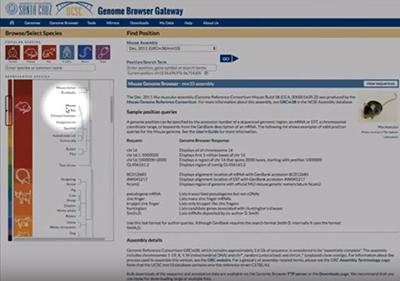 This tutorial shows how to obtain coordinates of genes, then input those coordinates into the Genome Browser for display. The regions do not have to be continuous in the genome. 0:41 - Set the Genome Browser to defaults. 1:00 - Go to the Genome Browser at the hg19 human assembly. 1:21 - Turn on the UCSC Genes track and an RNA-seq track. 3:13 - Get gene coordinates using the Table Browser. 4:27 - Paste list of genes into the Table Browser. 4:55 - Extract coordinates of genes. 5:31 - Reorder gene list and add optional header lines. 6:04 - Get help for Multi-Region mode. 7:24 - Load coordinates into Multi-Region. 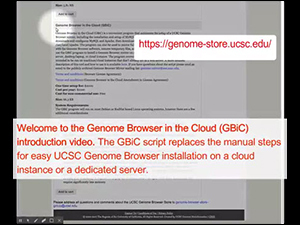 This video illustrates the features of the gateway page, which provides access to all genome assemblies of the UCSC Genome Browser. 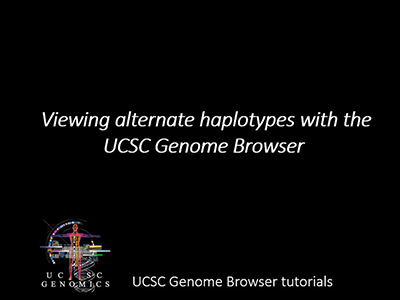 This tutorial shows how to use Multi-Region display mode to substitute alternate haplotypes into the proper place in the genome assembly. For a more comprehensive review of all the features of Multi-Region Display, please see the User Guide. 0:17 - Set up the Genome Browser display. 0:34 - View alternate sequences. 1:44 - Fetch sequence of right end of alt. 2:55 - Fetch sequence of left end of alt. 3:18 - Blat the alt ends. 4:37 - Substitute alt ends into chromosome. 6:10 - Track lifted from hg19 lacks hg38 annotations on alt. 6:31 - Remove alt from main chromosome. 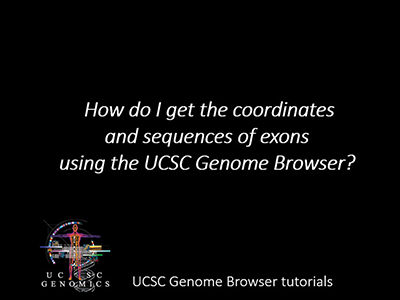 This tutorial demonstrates how to retrieve the coordinates and sequences of exons using the UCSC Genome Browser. 0:33 - Set up the Genome Browser display. 1:25 - Zoom out to region with several genes. 2:20 - Set up Table Browser. 3:00 - Export exon coordinates. 4:06 - View exons as Custom Track. 5:40 - Export sequences of exons. 7:00 - Confirm that the negative-strand sequences are in the correct sense. 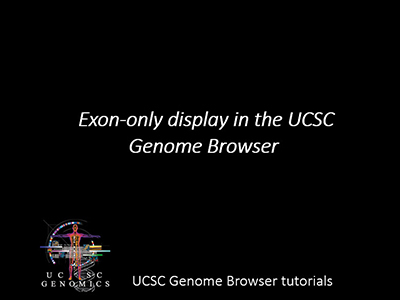 This tutorial demonstrates the Multi-Region exon-only display mode of the UCSC Genome Browser. 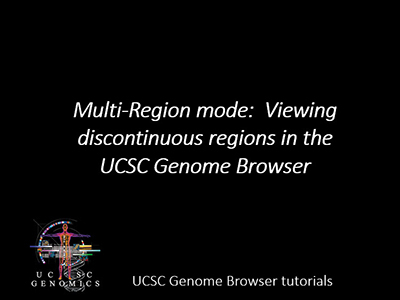 For a more comprehensive review of all the features of Multi-Region View, please see the User Guide. 0:31 - Set up the Genome Browser display. 1:04 - Enable multi-region display: Exon-only. 1:34 - View gene with multiple isoforms. 2:11 - Remove non-coding genes from display. 3:10 - View RNA-seq data in exon-only mode. 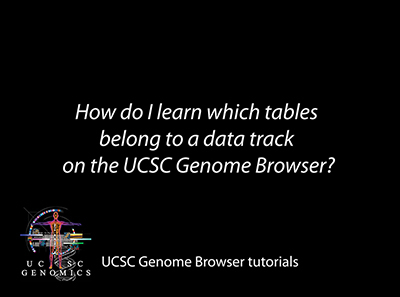 This tutorial will demonstrate how to find the tables in the UCSC database that are associated with the data tracks in the Genome Browser graphical viewer. 0:42 - Set up the Genome Browser display. 1:18 - Turn on data tracks. 2:03 - Find a gene. 2:45 - Find tablename by mouseover. 3:38 - Find tablename by table schema: Use minibutton to access configuration page. 4:33 - Find tablename by table schema: Use track-control link to access configuration page. 4:47 - Find tablename by table schema: Click an individual item. 5:25 - Check contents with Table Browser: All fields. 6:53 - Check contents with Table Browser: Extract selected data fields. 7:25 - Download entire table. 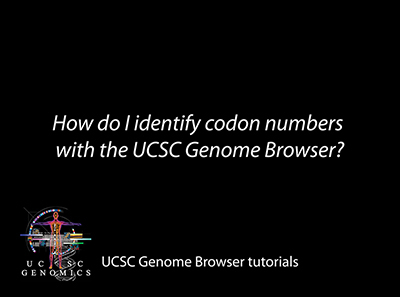 This tutorial will demonstrate how to locate amino acid numbers for coding genes using the UCSC Genome Browser. 0:36 - Set up the Genome Browser display. 1:35 - Open genes tracks: UCSC Genes, RefSeq, GENCODE. 2:17 - Locate your gene and zoom to an exon. 3:26 - Turn on RefSeq track coloring-by-codons. 3:51 - Zoom to codon level. 4:23 - Use minibutton for track configuration: Show codon numbering. 5:16 - Configure composite track. 5:44 - Confirm codon numbers with OMIM AV SNPs and UniProt Variants. 7:14 - View UniProt Variants details page. 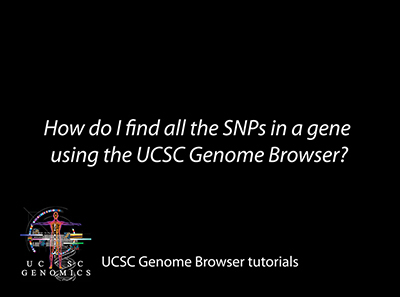 This tutorial demonstrates how to find all the single nucleotide polymorphisms in a gene using the UCSC Genome Browser. 0:43 - Set up Genome Browser display to see your gene. 1:35 - Turn on the SNPs track to see SNPs in your gene. 3:27 - Get SNPs from the Table Browser. 4:36 - Load Table Browser results as a Custom Track. 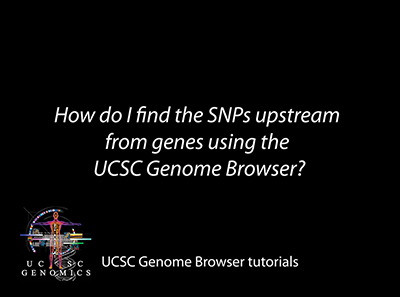 This tutorial shows how to find all the single nucleotide polymorphisms upstream from genes using the UCSC Genome Browser. 0:43 - Set up the Genome Browser display to see your gene. 2:00 - Use the Table Browser to get upstream regions. 3:38 - Paste and view your upstream regions as a Custom Track. 5:23 - Intersect upstream regions with the SNP track. 6:43 - Load upstream SNPs as a new Custom Track. 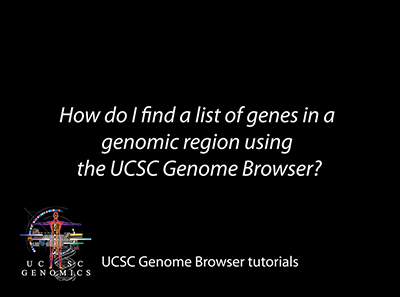 This tutorial shows how to use the UCSC Genome Browser to find a list of genes in a given genomic region. 0:54 - Set up the Genome Browser display to see the genes in your region. 1:31 - Zoom to a cytoband. 1:54 - Display only one isoform per gene. 2:20 - Use the Table Browser to get the list of genes in your region. 3:40 3:40 - Use knownCanonical table in the Table Browser to list only one isoform per gene. 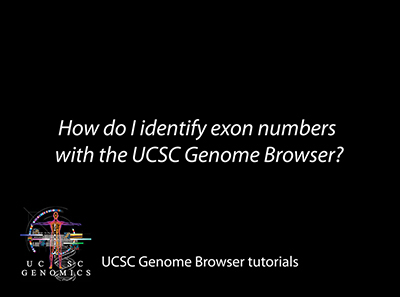 This tutorial shows how to navigate between exons of a gene using the UCSC Genome Browser. 1:11 - Zoom to a single exon. 1:55 - Adjust width of graphic display. 2:20 - Highlight a region. 2:39 - Jump to the next exon.